Data released by Ohio’s Job and Family Services on May 20 and May 24 shows a slight increase in both local and statewide unemployment rates. 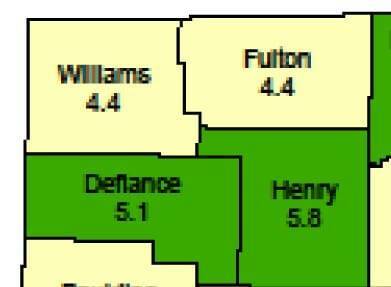 Both Williams and Fulton Counties have a current rate of 4.4%, better than the statewide unemployment rate of 5.2%. The April statewide rate of 5.2% is up from 5.1% in March and from 5.0% 12 months ago. Likewise, the number of unemployed has increased across the state, growing from 294,000 to 302,000 between March and April. The 302,000 is up from 287,000 12 months ago. These numbers are in spite of the fact that all of Ohio’s 88 counties reported a decrease in their unemployment rates over the month. Counties with the lowest unemployment rates included Mercer (3.0%); Auglaize, Delaware, and Holmes (3.3%); Hancock (3.4%); and Putnam, Union, and Wyandot (3.5%). Counties with the highest rates included Monroe (12.3%), Jefferson (8.8%), and Noble (8.7%). The national unemployment rate remained steady over the course of the month at 5.0% and remains down from the mark of 5.4% 12 months ago. Job gains over the month were seen in construction financial activities (+4100), educational and health services (+1200), and construction (+900). Losses were seen in local government (-6100); business services (-5100); trade, transportation, and utilities (-2900); manufacturing (-2700); other services (-1000); leisure and hospitality (-800); state government (-500); federal government (-400); mining and logging (-200), and information (-100). Be the first to comment on "Slight Increase Seen In State Unemployment Rates"